The results of a study funded by the U.S. National Institutes of Health, was published in the journal JAMA Otolaryngology-Head & Neck Surgery. The study may have been small, but the impact could be large. If you suffer from chronic sinusitis, you know the toll it takes on your personal and professional life. In the U.S., sinus infections cost more than $13 billion in lost productivity each year. Chronic sinusitis reduces productivity in the work place and also causes lost time at work. Chronic sinusitis also causes chronic pain, which degrades the quality of life. According to one of the researchers, Dr. Jordan Josephson, "Chronic sinusitis is the number one cause for chronic fatigue and is closely associated with snoring and sleep apnea.” These also contribute to loss of productivity and loss of quality of life. Traditional chronic sinusitis treatment has been medical interventions such as antibiotics, antihistamines and nasal sprays. This treatment is aimed at keeping the nasal passages clear and dry. The most effective drug treatment depends on the cause of the infection. Sometimes the cause is uncontrolled allergies and asthma, but in many cases the cause can’t be determined. Surgical intervention procedures may include the use of probes and a laser to remove tissue, bone or polyps that have developed during the infection. These can narrow the nasal passages. Some new surgical procedures can be done with local anesthesia. For many people with chronic sinusitis, surgery seemed to be the only option. However, the results of this study show that may not necessarily be the case. According to the JAMA Otolaryngology-Head & Neck Surgery article, among the 38 patients with chronic sinus infections in the study who continued with medical therapy rather than have surgery, the annual cost of lost productivity dropped from more than $3,400 to about $2,700 over almost 13 months of treatment. Days missed from work were reduced from five days to two days. The number of days the participants reported going to work sick was cut from 17 days to 15 days. The decision for the type of treatment should be a shared decision-making process between the ear, nose and throat professional (ENT) and the patient, considering expected outcomes and associated potential risks. Researcher Luke Rudnick, with the University of Calgary noted "Patients who have severe reductions in their productivity and quality of life can get significant improvements in productivity by choosing endoscopic sinus surgery." For some patients it might still be the best option. 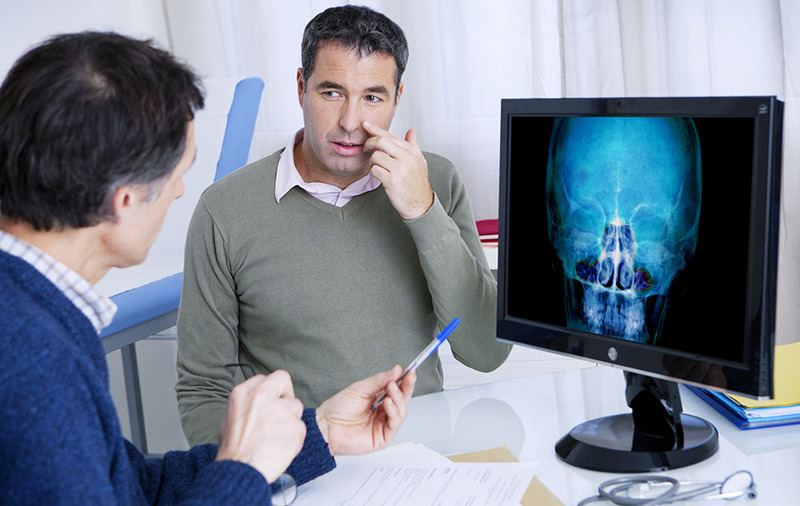 If you are bothered by chronic sinusitis, make an appointment with your ENT to discuss treatment strategies and determine what is right for you.